Meet Larelle and Jo from Houston, Texas, USA. 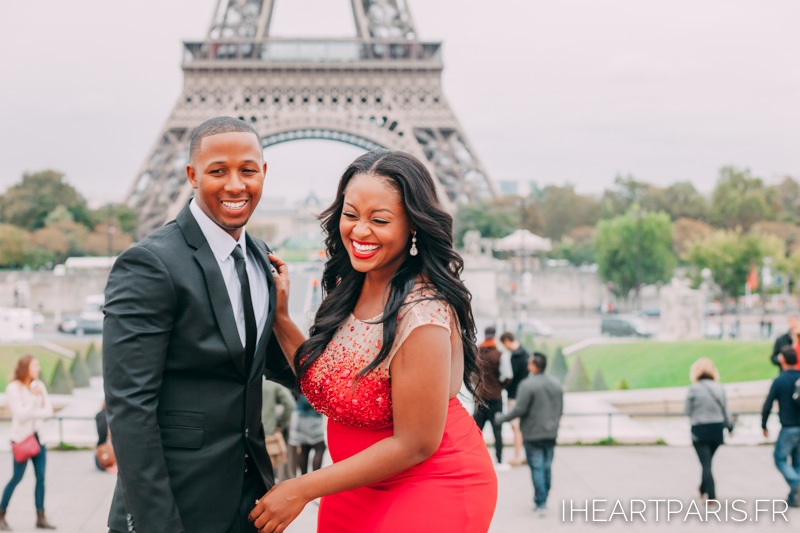 They contacted us because Jo was taking Larelle to Europe as a wonderful birthday gift and they wanted to have a shoot City of Lights and Love to capture the memories of their time in Paris. We divided their shoot into day and nighttime sessions to give them the most unforgettable experience and a variety of photos. For part one, we met at Trocadero where we had an "Aww" moment after realizing they were both wearing a pair of Louboutins. That's love and style right there, so obviously we had to show of the shoes in a photo. These two have been highschool sweethearts and as a little special memento they brought the teddybear Jo gave Larelle when they were 15 to take part in their photoshoot in Paris. We were so touched by this little gesture, since we also have a sentimental toy sloth we call Quilmes that we take all over the world with us to take photos with it! When we wrapped up at Trocadero, the four of us headed over to Pont des Arts where we found the one good panel for their Love Lock. Both Larelle and Jo changed outfits to a more casual style but still beautifully matching Burberry T-shirts. We wanted to give them an extra surprise and did a Cinemagram of their key toss as well as the traditional photos. For part two, Larelle and Jo chose the Louvre Pyramid and the gorgeous Alexander 3 bridge. These are also our favourite locations in Paris for capturing the nighttime portraits. Lit with the golden glow of the timeless Parisian lights (a little of of help from our strobes) we have captured the portraits that look exquisitely elegant and timeless to celebrate the birthday Larelle will remember for years to come.